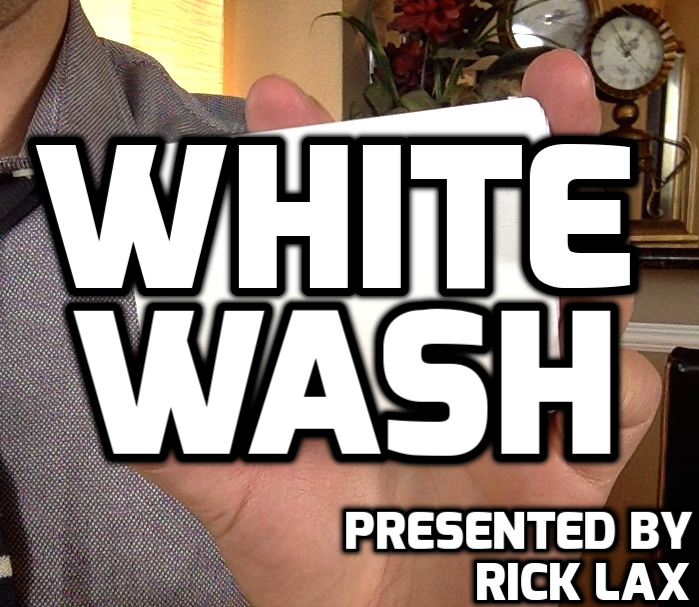 Today, when you order "Whitewash by Rick Lax", you'll instantly be emailed a Penguin Magic gift certificate. You can spend it on anything you like at Penguin, just like cash. Just complete your order as normal, and within seconds you'll get an email with your gift certificate. After years of absence, the #1 MOST OPTICALLY STUNNING DECK TRANSFORMATION is back in stock, and better than ever. A full deck of red Bicycle plays cards INSTANTLY MUTATES in the incredible, visually jarring way imaginable. The cards’ backs and faces turn stark white—every last one of them. And after the change, you can show the deck in the fairest way possible. WhiteWash is Rick Lax’s personal (until-now secret) handling of the classic Mental Photography deck. Lax hasn’t just COMPLETELY CHANGED THE EFFECT, IN THE MIND OF THE SPECTATOR, he’s put together TEN NEW IDEAS that feature the WhiteWash deck. And when you purchase WhiteWash, you’re going to learn all of them, for free, by Instant Download. 2) WhiteWash: Rick’s UPDATED, ‘reverse-Mental Photography’ presentation. 4) The Rotating Transformation: The cards TRANSFORM from printed to blank AS YOU ROTATE THE DECK in your hands. Uses a little sleight-of-hand, but it’s worth it. Note: This transformation uses a very similar sleight to the previously-published utility sleight "Clip Spin Change" by Mike Hankins. 5) The Flap Transformation: FOR ADVANCED CARD MECHANICS ONLY. This might be the most visual way to change the deck, and you can only perform it in certain situations…but if you’ve got the skills and the right environment, it’s KILLER. 6) The Six Pile Selection: After cleanly displaying the cards, you cut the deck into six piles. The spectator eliminates five of them, and after she does, the card atop the remaining pile is THE ONLY CARD IN THE DECK. It’s a FAIR AND FREE MENTAL MARVEL…with a super-visual kicker. 7) The Spectator Cuts: It’s similar to the last trick, only this time, THE SPECTATOR CUTS THE CARDS. Rick will teach you how to handle the cads in such a way that the spectator freely handles the deck, yet has no idea whatsoever that the deck is gimmicked. 8) Multiple Selections: If you’re performing for more than one person and you want to get them all in on the action, this is the way to do it: SEVERAL SPECTATORS select cards, and after they do, the rest of the cards vanish. This trick can be done at the table or in walk-around situations. 9) The Signed Card: Here, Rick will teach you how to incorporated a chosen, SIGNED playing card into your WhiteWash presentation. You’ll leave your spectators with an amazing souvenir, and you won’t destroy your deck in the process. 10) Two-Card MP: This is Rick’s version of the traditional Mental Photography plot that uses only two cards. YOU HAVE TO SEE IT TO BELIEVE IT. I have been performing my own version of "Mental Photography" as a killer ending to my close-up show for 22 years. During the show I swap decks to set up. I have been in love with the stunning visual effect since the late 70's. A little girl once saw me perform it, and told her mommy, "That's not like that guy on TV, mommy, that was real magic." which is the highest compliment I could ever hope for. Apparently "mommy" thought so too because she was still standing there completely stunned at what she had just witnessed. Only one problem. I had to completely make everything up from scratch by self teaching myself what the deck could do. The original "pitchman" instructions truly sucked in so many ways. As a result I've been doing some of the "Svengali" type give-away moves for as long as I've been performing it. I knew there had to be better ways of handling the deck, but kept performing the same way because nothing felt comfortable. Now, among the hundreds of "new" magic entries out there, came an e-mail from Penguin demoing "WHITEWASH". Damned expensive for a deck of old "Mental Photography" cards. But with it came a promising video by Rick Lax. Fine, here's my hard-earned cash, I'm hungry for something I can actually use in my shows. Great, not an instant download, gotta wait even though I already have an "MP" deck, several of them. Then late today, the video opened up for me to download. After years of searching for usable material for the "MP" deck, Rick Lax opened up with a jackpot of SUPER, FANTASTIC, very USABLE, very NATURAL, and surprisingly VERY EASY moves and subtleties that I can instantly incorporate into my existing routine. THIS made up for every wasted dime I've spent on magic in the last year. I already know the "MP" prop is second to none, but the video that accompanies it is what the original instructions should have consisted of. Even if you've never picked up an "MP" deck before, this set will have you doing professional stuff in no time. As for me, if my "MP" routine was considered "real magic" before, I suppose now it will become something from another dimension. Again, Thank you, Rick. Thank you, Penguin Magic; and thank you to all involved for a super-quality product. You earned my trust and my business with this one. Thank you Rick! Your handling or more accurate a reengineering of a classic effect! You've made the mental photography deck relevant again. Great instructional video. This is by far the best trick deck to have in your bag of tricks. For best results I tightened up the deck with a fresh coat of matte. It made a big difference and is cheap enough. The illusion of this deck is amazing to look at even when you know the secret. I am amazed on how easy this deck operates and looks in action. You can do this trick over and over and they still will not know the secret. I would give this deck ten stars if possible! The deck is top quality and the instructions were very good. This is currently my most popular trick that I perform. Some presentations may require basic sleight of hand. It really blows people away and it is very easy to switch with a regular deck. I highly recommend it. I haven't touched a metal photography deck in roughly 7 years, but White Wash changed all of that! This is a game changer! The deck has many more possible routines than the old hat version. Also, Rick Lax makes everything clear, giving pro tips, not leaving anything unturned in his video, as per usual! After all these invisible deck years, it is not a one up mechanical trick! Rick unlocks the layers and depth of befuzzelment locked in the deck you may already have. If you don't think you need another invisible deck? You don't! You do need this comprehensive lesson in fantastical card revelations! A fantastic gaff deck that is easy to turn your nose up at if you "never use gaffs," but don't because you will be missing a real visual worker. Great ideas and detailed tips from Rick as usual. A steal at 20 bucks as usual. Probably worth it at 30'bucks as well but I always feel that 10 bucks makes a big difference. That penguin is a smart guy. Hello, it's your card magician, Electz. I can't recommend this enough. This is a great take on an old classic. Lax does a great job on teaching, it's outstanding. The effect is so great, I will use this for a big gig I have coming. A real great take on an old classic! 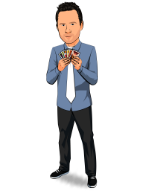 Rick shows multiple ways of transforming the deck and handling it and makes the trick a whole lot more believable. Firstly thank you rick Lax.Presentation and teaching the game very well.Great deck.Very high quality and visually.I would recommend it to everyone.You will not regret.